As I was browsing through my Facebook a few weeks ago, I came across this very interesting critique shared by one of my subscribed pages about the five most pathetic female film characters of all time. 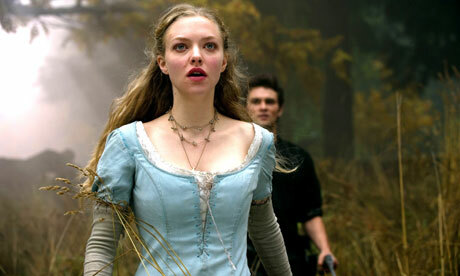 The writer of the article, Lindy West, mentions these five characters: Amanda Seyfried in Red Riding Hood, That Blonde Lady in Indiana Jones and the Temple of Doom, The Childlike Empress in The Neverending Story, Bella in the Twilight Series, and Buttercup in The Princess Bride as characters who act as “old-timey, textbook damsel-in-distress[es].” She basically condemns these characters for the fact that they just stand there, cry, and are useless. For instance, in the case of Bella, she is only existent when Edward is with her; otherwise, she is “paralyzed by grief.” West keeps in mind that fighting some of these monsters would be incredibly tough to do alone, but putting forth some effort is the least these characters could do to assist their men in shining armor. She mentions how most women in modern society can easily hold their own and don’t expect to sit there in complete hopelessness. Lindy West is very blunt in this article, which I found refreshing. She wasn’t afraid to blatantly point out the flaws in these characters and society. Sometimes, this utter brashness is called for in order to truly get a point across. Indeed, these female characters of relatively recent movies should definitely be more self-sufficient than they are. What are these movies communicating other than that women are helpless without men? Haven’t women made enough progress to be rid of this feeble nature being portrayed in media? It is like with every step forward toward a more gender equal society, two steps are taken aback due to some generations-old point of view. Nonetheless, we must keep in mind that more movies and story plot lines are starring strong female characters that outshine the previously stated female characters. In order to rid the weaker female characters memory from people’s minds, this progress must be highlighted and focused on. However, this becomes increasing difficult when the weaker female characters’ movies are popular and/or star well-known actresses. Will the movement toward gender equality ever catch a break? What do you think? Do you think that these pathetic female film characters don’t take away from the other movies or TV shows that star competent female leads? Are Lindy West and I reading too far into this? Should we just enjoy the movies for what they are worth, even if they only show the men being capable? Or is this a legitimate observation to be concerned about? Furthermore, if this is a concern, what can we do as women and viewers to try and get rid of these plot lines? If generally people enjoy the story, what can we really do to deter its popularity? It would seem that we have been backed into a corner. I think it's interesting that with female characters, we either see them as weak and submissive, or strong and independent. The "damsel in distress" idea has existed for so long, that no matter what new kind of female character is introduced, we subconsciously compare it in our minds to the original, pathetic female character. This makes it extremely hard to make any changes, because as long as that stereotype exists in our minds, nothing can be done to get away from it. Even if a female character exists that completely opposes the weak, subordinate female role that one might expect, we will just see it as, "Oh, they're trying to portray women in a different light."